303 Squadron (named after the Polish and American World War I hero Tadeusz Kosciuszko) was actually just one of sixteen Polish squadrons fighting in the Royal Force during World War 2. The other Polish fighter squadron was 302 Poznan Squadron. By the war’s end more than 19 000 Poles had served in Allied Air Force units. However, 303 Kosciuszko became the best known of these Polish squadrons, mainly because of its outstanding record during the Battle of Britain. Flying Hurricanes, 303 Squadron became the highest -scoring of all Hurricane squadrons during that battle, was well as achieving the highest ratio of enemy kills to their own lost in combat. It claimed 126 German planes shot down. The squadron’s pilots gained a well-deserved reputation for audacious, near-suicidal risky tactics in air combat, favouring very close fast-closing combat at high speeds. The typical RAF close formation tactics were not favoured by the Poles. At first the pilots of 303 Squadron were regarded with some disdain by many in the RAF. The presumed rapid defeat of the Polish Air Force by the Nazis favoured the perception that Polish pilots were not of the highest calibre. Initial language difficulties (and probably some jealousy over the Poles’ considerable popularity with English women) added to the problem. At first 301 and 303 Squadrons were not allowed to fly. 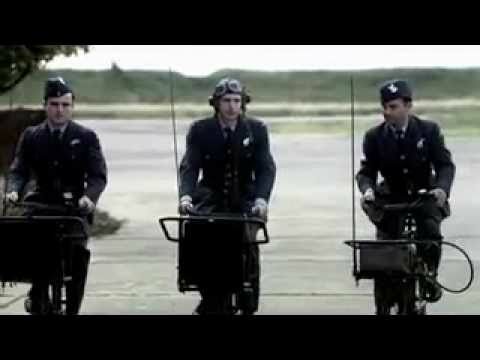 Instead they had to endure riding tricycles with compasses and radios attached as they practised the RAF tactical formations on the ground.Understandably this caused considerable resentment.-see frame from movie below.